Based on reviews from 8 experts and 1,825 users. Learn how our rankings work or see our guide to Adidas Mundial football boots. Updated Apr 2019. When thinking about a truly classic soccer shoe, perhaps the first thing that comes to mind is the Adidas Mundial football boot. As part of the Adidas Copa silo, this historical football boot has been worn by athletes with the likes of Diego Maradona, Franz Beckenbauer, Miroslav Klose, Zinedine Zidane, Kaká and several other legends on the pitch. Created to be unveiled in the 1982 FIFA World Cup in Spain, its release was in 1979. For three decades the Adidas Mundial football boots have been continuously produced by Adidas, and in more recent times, the brand has created different versions the shoe while retaining the look and feel of the original pair. Starting from the upper, the most coveted premium kangaroo leather upper wraps the player's foot creating a snug, comfortable fit. Giving the player a great fit fresh from the box, the material needs little to no time for break-in. Because of its moldability, the k-leather conforms to the shape of the wearer’s foot creating a truly personalized fit. A shock-absorbing EVA (Ethylene-vinyl acetate) has been incorporated into the insole; a feature most useful for injury prevention while adding to comfort. Dual density outsole. A dual-density outsole is used by the shoe for enhanced grip on firm natural grounds. Gum rubber. For indoor courts, gum rubber outsoles are commonly used for optimal traction. Traxion outsole. 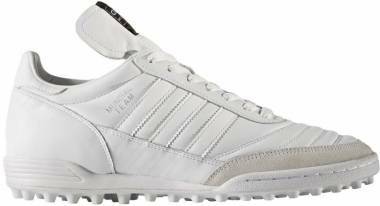 Adidas Mundial football boots for turf courts usually sport a Traxion outsole which features a tapered stud design which aids ground penetration without the stud pressure. Adidas Copa Mundial (White colorway). It wasn’t until 2013 that substantial aesthetic changes were made in the year’s release of the Adidas Mundial football boot. The pair sported a new colorway with white occupying most of the boot along with black accents that colored the brand logo, the shoe’s laces, and the tongue area. These first major changes in a long time afforded the brand a new direction in making updates for their future Adidas Mundial football boot releases. Adidas Mundial Goal. Following the release of the white colorway, the Adidas Mundial Goal was also launched in 2013. Described by an expert as a mix between the Adidas Copa Mundial football boot and the Super Sala, the k-leather upper brings the same comfortable fit and ball touch as the Copa Mundial. The material used in the outsole is gum rubber which effectively grips indoor courts. Adidas Mundial Team Modern Craft. Two years after the Samba release, Adidas went with a new direction and created two separate collections from the Adidas Copa Mundial shoe; a specific collection was created for Adidas Mundial football boots and another for the brand’s Copa series. The first release of the Adidas Mundial Team is the Modern Craft football boot. While still sporting the k-leather upper that Mundial cleats are always associated with, the outsole of the Mundial Team Modern Craft boot is made for the streets. Adidas Mundial Team Pack. Another Adidas Mundial football boot release happened in 2017. A soccer shoe still designed for the streets, the Mundial Team Pack has been available in the ‘Triple Black’ and ‘Triple White’ colorway. Furthering this model’s durability is its suede toe cap and heel counter incorporated in its design. Adidas Mundial Team (EQT Green Pack). Perhaps the most recent release of Adidas Mundial football boots is their model under the limited edition EQT (Equipment) pack. A football boot with an interesting green colorway, it still holds a k-leather upper paired with an EVA midsole. Adidas’ TRAXION outsole technology has also been integrated into this model for optimal traction in artificial turf courts. What are the similarities and differences between the Adidas Copa Mundial football boot and the Nike Premier shoe? There have been speculations that the Nike Premier boot has been created to directly compete with the iconic Adidas Mundial football boots that belong to the Copa silo. True enough, the two models hold the same aesthetic, but digging deeper, the two models also have differences in construction. It is a well-known fact the Adidas Copa Mundial football boot sports a kangaroo leather upper which lends way to the football boot’s snug, comfortable fit. The Nike Premier upper, on the other hand, have sparked debates on whether goat or kangaroo leather has been used in its upper. Either way, the fit of the pair is soft and comfortable right out of the box, needing a minimal amount of break-in time. Perhaps one of the most obvious differences between the Adidas Mundial football boot and the Nike Premier model is the tongue. Keeping its classic design from the last thirty years, it’s well known that the sizable, fold-over tongue of the Adidas Copa Mundial is not for everyone. While the pair is well-loved by patrons, it’s been a common dilemma for players on what to do with the tongue; with some opting to cut it off. Others, however, love the overall classic look of the shoe. The Nike Premier football boot has played it safe by opting for a shorter tongue that is cut off in the ankle area. When it comes to weight, there is a significant difference between the two models. Unsurprisingly, the Nike Premier is relatively lighter than the Mundial. While the virtually unchanged Copa Mundial football boot has kept its shoe construction for the last three decades, the more recent Nike Premier has been afforded with innovations in technology that help shave off the weight. Stud Configuration. Both models make use of a 12-conical stud configuration to promote traction. Four studs are placed in the heel area for both shoes. However, the difference comes with the placement of the studs in the forefoot. The Copa Mundial has three studs in the inner part of the boot, four for the outer and one placed in the middle. While the Nike Premier wears four studs on each side with a longer stud in the middle of the forefoot. While both boots belong to a relatively budget-friendly price range, there is a substantial difference between the two shoe’s price range. It’s been revealed by the ‘Swoosh’ that the aim of creating the Nike Premier football boot is to offer quality cleats at an affordable price range - and they’ve been successful with this endeavor. Admittedly, the Adidas Copa Mundial slightly costs more than the Premier but, the pair still belongs to a reasonable price range. Nevertheless, both of these football boots are a definite bang for the buck. Adidas EQT stands for Adidas Equipment which was started by Peter Moore in the early 90’s. It was a sneaker which sported a green/ white/ black colorway and was culturally relevant during the fall of the Berlin Wall. In 2017, the brand paid tribute to this iconic shoe with their Limited Edition EQT Green Pack release which included the ACE 17+ Tango Purecontrol, Mundial Team and Copa 17.1. The new release featured the recognizable green/white/ black colorway. What are the benefits of EVA? EVA (Ethylene-vinyl acetate) is known for its shock-absorbing qualities which are especially useful for injury prevention and, adding comfort in football boots.